Relationships – any kind of relationships – are integral to human existence. Our hearts soar with delight at the hint of first love and lay heavy and broken when the world crashes down. We love, sometimes unrequitedly so, hate when there’s nothing else left, and make stupid decisions because love is, after all, deaf, dumb, and blind. 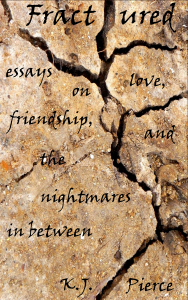 In this collection of personal essays, author K.J. Pierce reflects on the nature of love, relationships, and emotional attachments, examining not only what others have come to teach her, but her own motivations as well. Sometimes funny, sometimes raw, but always honest, she delves into her pursuit of answers with abandon, relishing those who’ve played an integral part in her life, learning from those who merely pass through, and ultimately realizing that most of the time there are only more questions.